Heavy rain overnight has led to disruption on roads throughout Argyll. The Met Office had an amber flood warning issued for yesterday and today, which has been proven well-warranted. The A816 Lochgilphead to Oban road is closed between Lochgilphead and Cairnbaan. The main artery is under a foot of water at the stretch known as the Meadows, with roads authority Argyll and Bute Council unable to say how long it will remain closed for. Motorists hoping to get to Oban should take the A83 Tarbet to Campbeltown road to Inveraray, the A819 Inveraray to Dalmally road and the A85 Oban to Perth road. The landslide prone Rest and Be Thankful at the A83 is closed as a precaution. The biggest slip yet occurred on October 28 and the clear up operation has been ongoing. The Old Military Road emergency diversion route was closed due to flooding last night, but re-opened at 5am today. Conditions are still wet and motorists are advised to take care. On the isle of Mull the B8035 Salen to Uluvalt road is closed by a landslide at Gruiben. 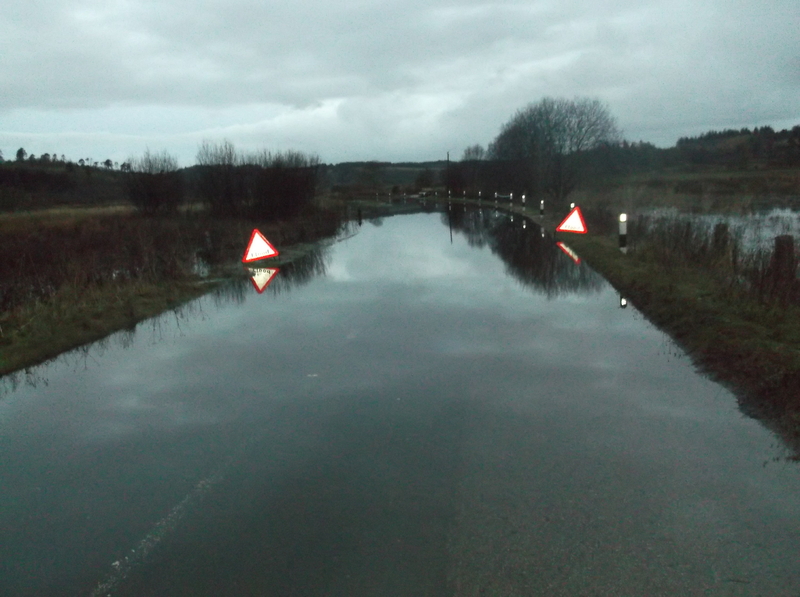 The B8073 closed by flooding between Gruline/Torloisk. In Tobermory, Back Brae is closed due to floods and debris. Ulva Primary School is closed as a result of the Mull landslide. On the isle of Jura the A846 Lagg Brae road is blocked by a landslide. The council said arrangements for clear-up are in hand. There is localised flooding in Campbeltown, motorists are advised to take care.